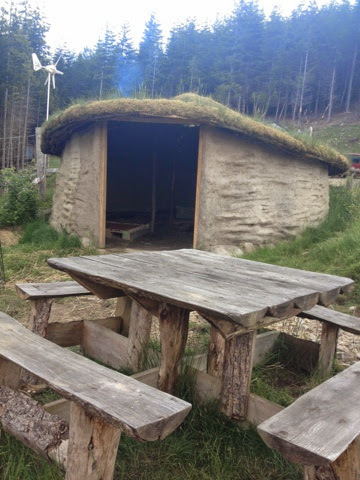 The second day of our Prehistoric Cookery Course at Wild Rose Escapes. 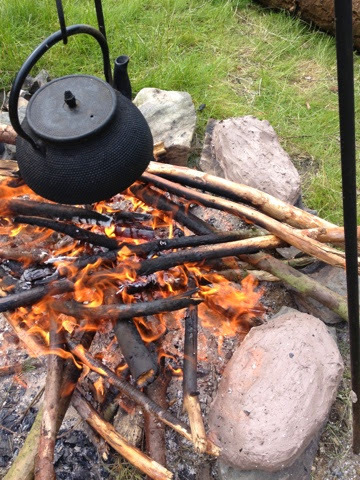 Read my first post here for day one with Pit Roasting, Pot Boiling and more. 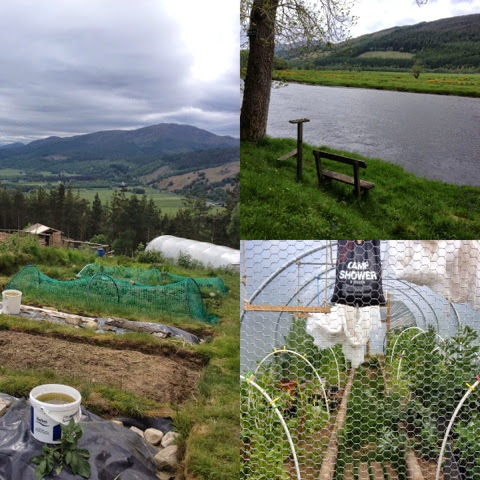 Sunday morning, the sun was shining on the Highlands and we headed down to the riverside to do a wee bit of foraging for spring greens. Could there possibly be a more idyllic setting? 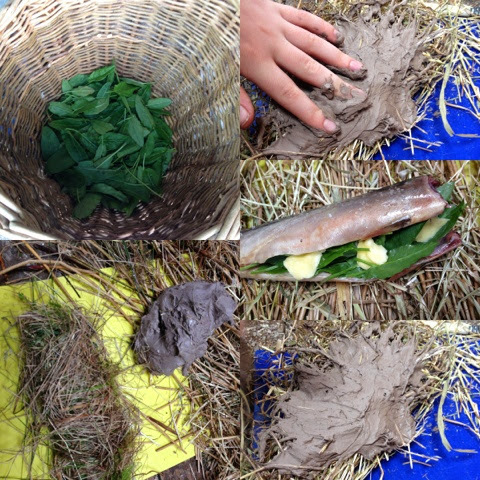 Our main meal was to be Clay Baked Mackerel. 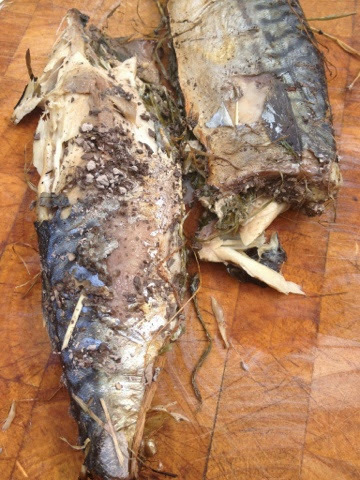 This was stuffed with our foraged sorrel, garlic, butter and seasoning before being wrapped in hay and reeds. Then came the messy (and fun) bit. Covering it all up with clay. Much trickier than you would imagine. It would have made a wonderful Generation Game challenge. 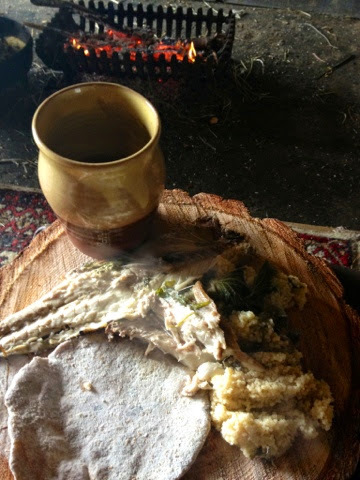 Our parcels of fish were placed on stones around the fireside where we kept an eye on them and turned them around every so often to ensure even cooking. Time for a mid morning snack. 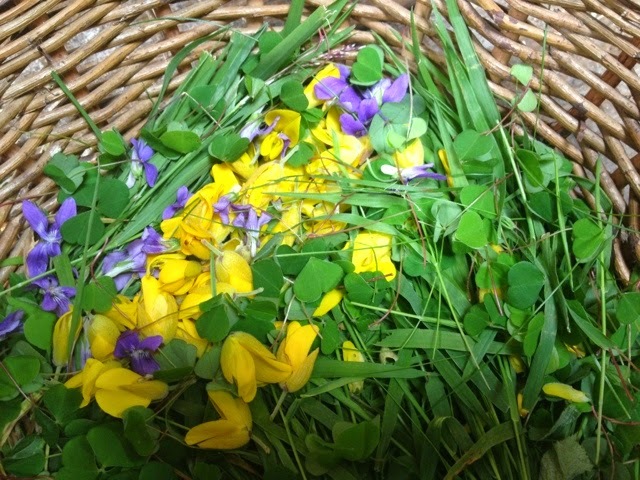 Foraged flowers this time. 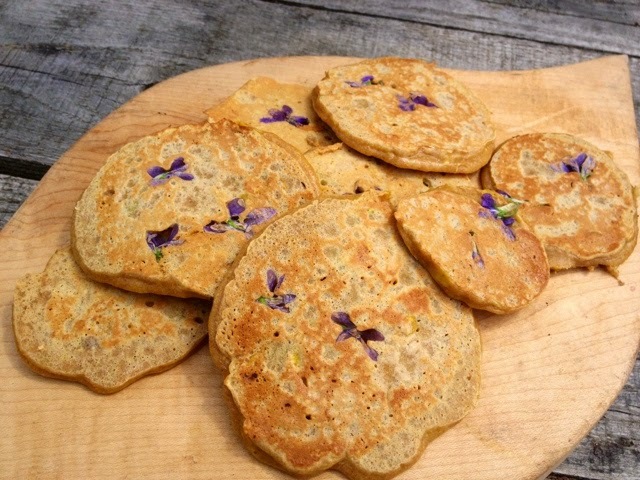 Gorse and Violet combined with honey, flour, eggs and milk to make beautiful looking and tasting pancakes. 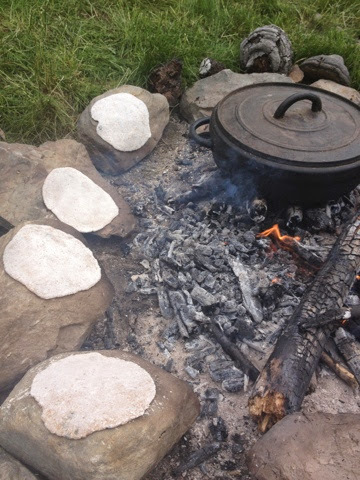 Flatbreads with Wood Sorrel were also cooked on the hot stones around the fire. A precarious balancing act to get them close enough to the heat without falling into the ashes. 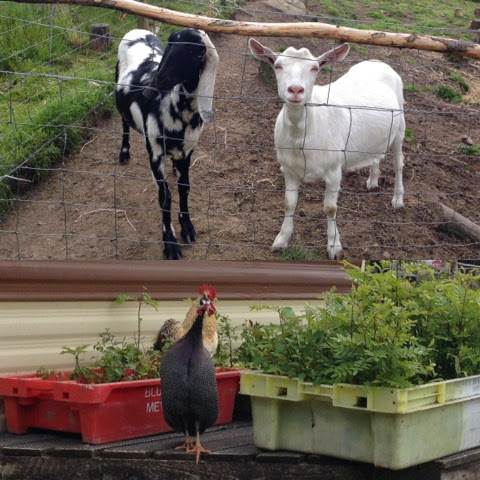 Throughout our weekend, in addition to forming friendships with Rosie and Alex, their daughter Thora and baby Martha we also bonded with their menagerie of animals. 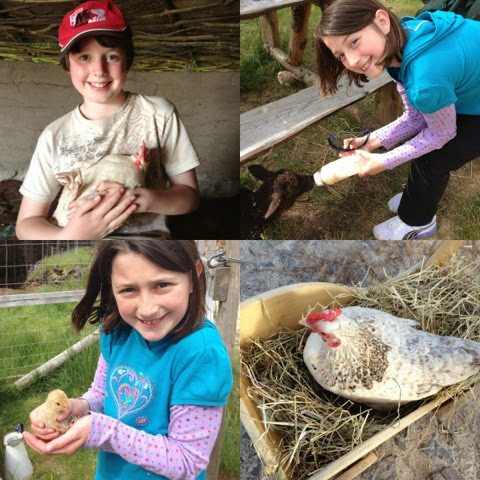 An honourable mention has to go to Mary a rather special - in all senses of the word - chicken. Time to crack open the clay and reveal our Sunday lunch. 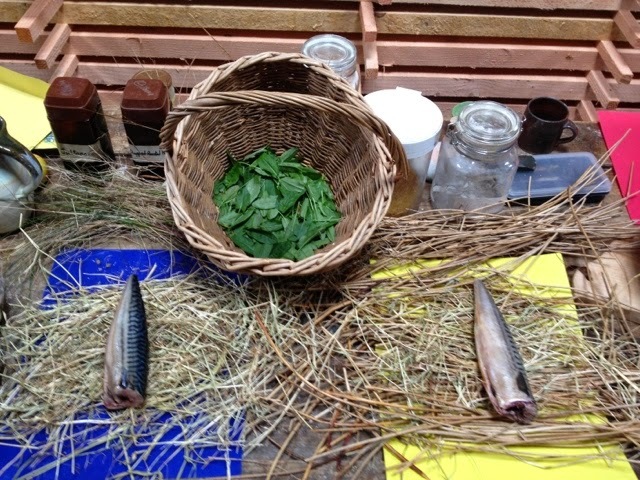 In addition to the clay baked mackerel we'd also cooked some up on a cast iron pot with bulgar wheat and greens. This was served up in the roundhouse along with our flatbread and Nettle Beer to wash it all down. Such a wonderful setting for Sunday lunch complete with candles burning above us in the candelabra. 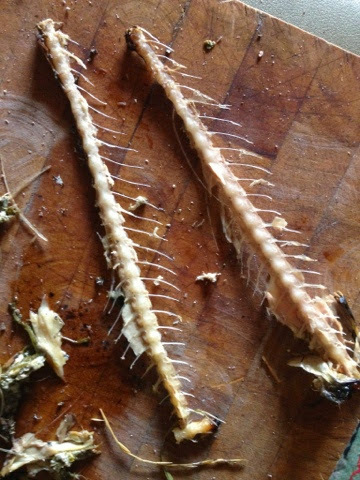 Our plates were scraped clean before being thrown in the fire along with our fish bones. All too soon it was time to say goodbye. We had had an absolutely fantastic weekend, learnt so much and thoroughly enjoyed the whole prehistoric experience from start to finish. 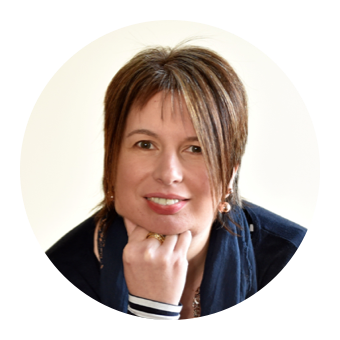 Rosie and Alex were passionate, enthusiastic, knowledgeable and the perfect hosts. 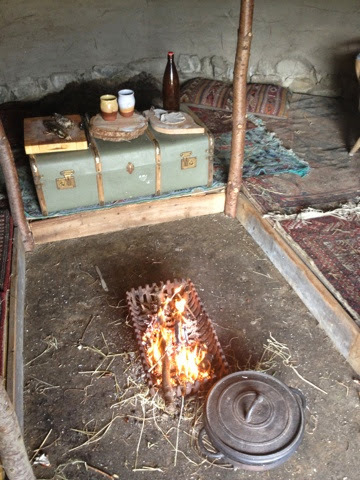 We left armed with a info pack of recipes and information on fire lighting, edible wild plants and how to build a pit oven. But most of all we left with wonderful memories and new found friends. Looks like so much fun, as ever.... Those foraged flowers look great, and the flatbreads! Looks like it was worth it to meet Mary alone! Mary was indeed the star of the show. You could just imagine the flatbreads being made in exactly the same way in prehistoric times. What an experience. Loving the look of the flatbreads and pancakes. Nice knowing what to forage for too. 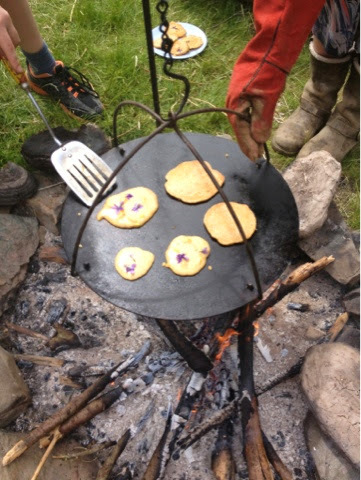 The pancakes were just so pretty and gorse and violet are easy to identify so no concerns about poisoning yourself! The baked mackerel and violet pancakes are right up my street. 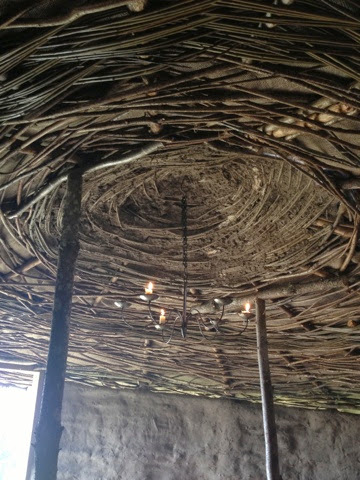 Our ancestors really were pretty clever when it came to cooking. How I'd love a much simpler life. I really need to get me on on of these courses it looks like a fantastic learning experience. 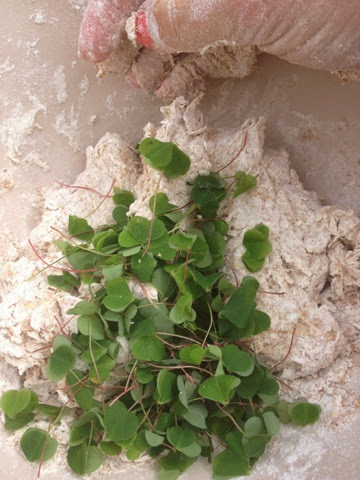 I've been telling myself I need to go on a foraging course for years but still haven't made it happen. You've definitely inspired me! Once you get into it I promise that you'll be hooked. There's a whole world out there to learn about.